I always love Pink Saturdays, although now we're in the depths of a freak early Winter, I guess it should be White Saturday - so here's a new freebie Christmassy background and header set for you. 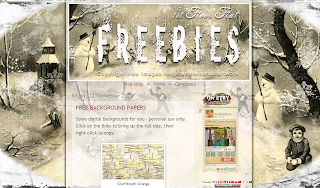 A sweet little vintage background for wide 2-col or 3-col blogs, this will work with Minima (old Editor) and Watermark (new Template Designer) plus some of the WordPress freebie templates. The header is 950px wide, so try saving without clicking the 'size to fit blog' option first, and if it's too big then reload it, clicking the option this time. If loading the header using my code, just make sure you wait long enough for the image to load. You should see it in the preview pane BEFORE you click 'Save. If you feel your text is too far to one side, or you use the default Blogger text and it looks too high up, then use my tutorial to adjust. Beverly at How Sweet The Sound has suggested Christmas recipes as this week's theme, so here are some recipe cards. Left-click to bring up to the full size, and right-click to copy to your computer. These are a new thing I thought I'd try: they measure 4 in x 6 in. (I'd appreciate a comment as to whether they download at the correct size, like they are supposed to). One for quilters and fabric artists, one country/shabby chic style and one vintage one. As they are a standard photo paper (and postcard) size, you could print them out and pop a photo of the dish on the back! If anyone does this, I'd love to see it. Here is the link for my Lethal Sherry Trifle, if anyone would like it. It's highly alcoholic but tastes wonderful! I do love them! I have 4 x 6 perforated paper card stock somehere! LoL. Love the background. I tried and at the time, some of my widgets were still in the old style and just didn't match. Will try again...now which one will I choose. What a pretty blog, Susie! Happy Pink Saturday! Love all the holly and the birdies in your header! 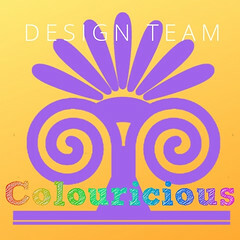 Hi Susie, Glorious background and the one you are using on your own blog at the moment is breathtaking! !♥♥ I printed the Vintage Snow recipe card without at hitch. However as it downloaded onto my computer at a "picture" I was unable to figure out how to type on it before I printed. My handwriting is spotty at best. 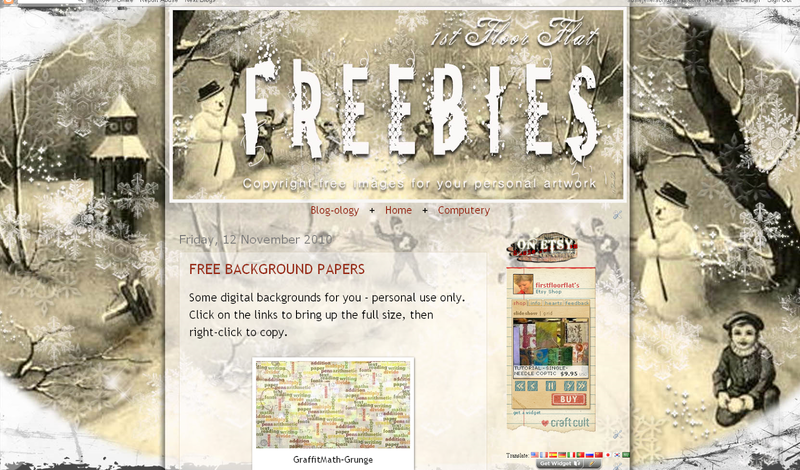 You always treat us to the most wonderful freebies on your blog, honey. I, for one, truly appreciate everything you do. Another beautiful Pink share. Love the snowman header and background. You are so darn good. Snowmen are my weakness. I sure do love the snowmen. I love that old black broom and the vintage feel of Frosty. So cute Susie, so cute. 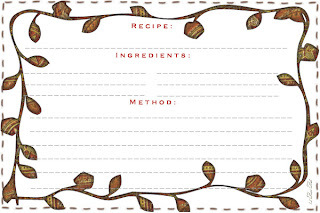 Now these recipe cards are so delightful. I love the vintage one, well the country one too, oh heck I love them all. You do such beautiful work sweet friend, and how generous of you to share with us pinkies. You are so delightful. Everything you do..either pink or white is outstanding! Have a great weekend! So pretty, I just love your work and those recipe cards are adorable! What a festive and beautiful background and header you have here, Mizz Susy. I just love it. Now, I had a little trouble loading it...it just may be my olden computer running slow this morning. Just sayin', so you might check it but most likely it is on my end. You recipe card looks amazing,truly!!! Thank you so much for you pretty,pretty words by me! Thanks so much gang, glad you are enjoying them. 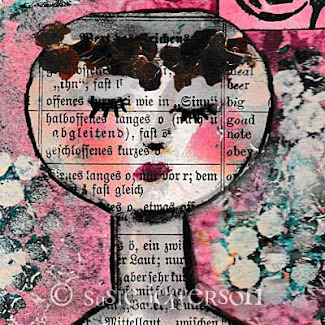 Maison Mutt: if you don't use any kind of digital art programme, you can use Word instead. Download my recipe cards then open a Word document, click Insert (on your top toolbar) and then Insert Picture From File. Browse to find the image you want to use then click enter. Use the corners to size the image on your page. Then go back to Insert, then Insert Text Box. This will open up a big square, which again you can resize, then drag & drop to position over the image. Type your text in the text box. You can resize and change text style etc, until you are happy. 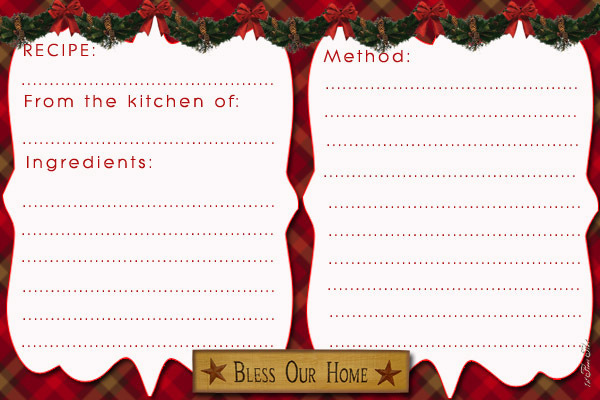 Then Save As, and your recipe card will be stored as a Word document which you can print out at any time. BJ: I think it's at your end. Nancy (see comment #1) is using it with no problem. You need to make sure you remove the coding for any other background completely before you load up a new one. Some sites, the background code stores in more than one place, so you do need to check this. Hope this helps. That recipe sounds so good but too expensive to make. I'll just drink mine straight. I love your header. Happy Pink Saturday. I guess I'm gonna have to fly across the big pond to try your lethal sherry trifle. :0) It's gotta be fabulous from reading the recipe. 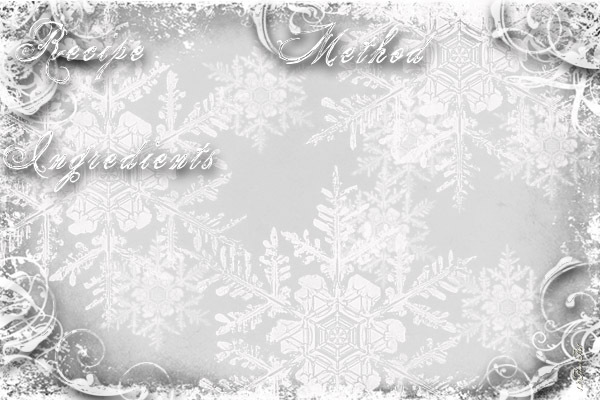 I like this Christmas background and header. I'm experiencing winter weather that I didn't have until late January last year...everyone has been saying for months that we were in for a hard winter. I'm preparing for 2 days of snow plus temps for most of next week not getting much above freezing during the day and down in the teens at night...brrrr! I've got lots of firewood for the wood stove so I'm ready! The central heat is great but the wood stove heat is so much better.